It’s Herbal Friday again! And it is also the last Friday of spring! Into a new season we go. It has been really lovely being in Durham this spring. My favorite part is seeing all the flower pop up in the trees everywhere. The Mimosa Flowers are exceptionally beautiful! They are hot pink dainty things. With the warmth in the air awakening all the life, it is also a great time for growing herbs! Especially MINT or Mentha! When I think of mint, I think about my childhood favorite, Mint Chip Ice Cream or basically Mint + Sugar = happiness. Though it is hard to pass up on mint candy, these days I prefer it in tea form. To be said though, I defiently have a long term love affair with this herb. I love its cooling nature and its distinctive taste. It is an herb that grows abundantly and will gladly take over the pot or area it is growing in, so beware! In Chinese Medicine this herb is know not only for its cooling nature and aromatic taste, but also its ability to release a fever. In TCM speak, a fever or cold is called an exterior attack. 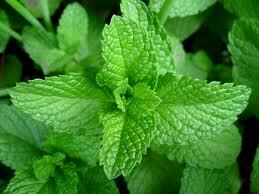 We use the mint to relieve the fever for adults or children. It can also be used to relieve headache or sinus pressure by drinking tea or inhaling the steam or even using the essential oil externally. Mint has anti spasmodic properties that relieves nausea and stomach cramping. Mint also can help with acne. It balances the androgen hormones and it has been said that if you drink mint tea everyday your acne will disappear. Mint is not only a medicinal herb, but also a culinary herb! It can be used in foods, but also in a tea to cool off from the hot days of these warmer months we are in. Mint tea is said to help neutralize body odors. 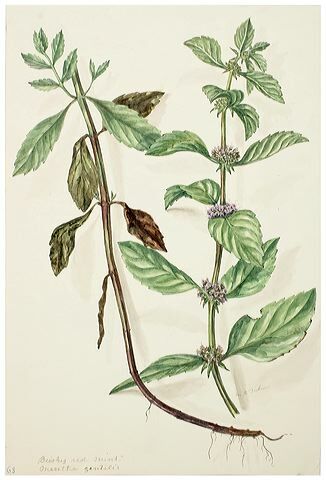 Mint can be used in foods for its flavor element. Add it to sausage, add it to jams or even make a mint simple syrup! It is a very distinct flavor and if it is one you love, the possibilities are endless! Mint itself is incredibly easy to grow. You can even take some clippings and put it in water till it sprouts roots. Then you can plant it in some soil and watch it flourish! In a nonreactive pot, combine the sugar and water. Cook on high heat, stirring for a minute or two, to dissolve the sugar. Add the mint into the pot and cook for 15 minutes on medium heat. Remove from heat and strain through several layers of cheesecloth or a jelly bag. If you want to can: Pour into clean half pint jars leaving 1/4″ headspace and process for 10 minutes in a boiling water canner. This recipe comes together pretty quickly, so you might as well start by bringing the boiling water canner up to a boil right off the bat. Bring water to a vigorous boil. Tear mint leaves and put in a teapot. Gently bruise mint with a wooden spoon to release oils, then add tea leaves, sugar, and boiling water. Cover and let steep 10 minutes. Previous postAcupuncture Needles, See For Yourself!